Luke Maye is leaving UNC after this season, but a Maye must always be in Chapel Hill. 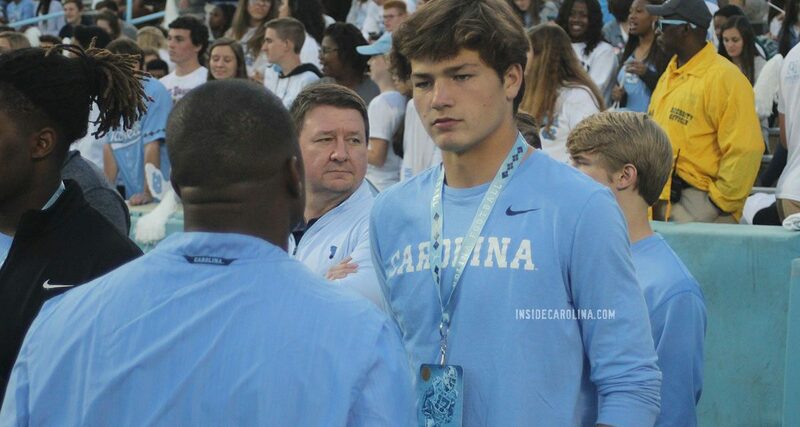 Luckily, North Carolina has already offered a scholarship to younger brother and class of 2021 quarterback Drake Maye. Drake, who plays for Myers Park High School in Charlotte, was ranked as the No. 50 overall player in the 2021 recruiting class in way-too-early rankings released by 247 Sports Tuesday afternoon. He is listed at 6’4″, just a few inches shorter than his 6’8″ older brother. Larry Fedora’s staff offered him a scholarship late last season, but it is likely that new head coach Mack Brown will honor the scholarship. Drake’s 247 profile also lists offers from Alabama, West Virginia, NC State, and Michigan. Maye has some athletic pedigree as his father was a quarterback at North Carolina and his brother, Luke, was a multi-year starter on the Tar Heels basketball team. The 6-foot-4, 200-pounder passed for 3,201 yards and 36 touchdowns against 5 interceptions as a sophomore. Maye possesses a strong arm and concise release, driving the ball on a line while throwing intermediate passes. He should have another big year in 2019 throwing to Power 5 receiver prospects in Muhsin Muhammad III, Porter Rooks and Elijah Bowick. Moving forward, we’d like to see improved mobility from Maye and are curious to his ultimate size as his brothers are 6-foot-7 and 6-foot-8. If Drake does end up in Chapel Hill, here’s hoping his career looks similar to that of Luke’s.